Apple held its 'There's more in the making' event earlier today in New York, and it launched quite a few interesting pieces of kit for those who appreciate its design and technology. Probably the biggest announcement for computer enthusiasts was that of the new Mac Mini, after all it has been quite some time since this range was updated. For portable computing Apple showed off an updated MacBook Air with lots of its latest frills such as a Retina display, Touch ID, and more. Last but not least, Apple announced that it would bring Radeon Pro Vega Graphics options to the MacBook Pro next month. It has been about four years since Apple last properly updated the Mac Mini. Thankfully it showed off a new model today and delivered quite a few important changes. Meanwhile, this compact desktop PC hasn't strayed from its iconic minimal design (but with "2x increased airflow"). Apple headlines it in its usual smug pun-strewn style as being "re-engineered in no small way". On the topic of performance uplifts delivered to the range came an eyebrow raising claim: "It has more than five times the performance," said Phil Schiller. So, now the minimum configuration features a quad-core 8th Gen Intel Core processor, and that can be paired with up to 64GB of RAM, and 2TB of fast PCIe attached solid state storage. In all, the upgrades delver up to 5x processing power, and up to 60 per cent faster graphics. Apple has added the T2 Security Chip to the design too. A good selection of ports is available around the back of your new Mac Mini. There you will find four Thunderbolt 3 ports, two USB Type-A ports, HDMI, audio and Ethernet (including a 10Gbps option). For wireless comms 802.11ac Wi-Fi and Bluetooth 5.0 is built-in. You can purchase a new Apple Mac Mini from $799 / £799 now, and it will ship starting from 6th November. Apple's MacBook Air was getting rather long in the tooth so this is a timely update to a popular SKU. Tim Cook called the sleek clamshell "the most loved laptop ever," during his presentation, and it has now received some welcome attention - or modernisation. The first obvious upgrade is the option for this 13-inch laptop to be equipped with a Retina (227 PPI) IPS display. Its native resolution is 2560x1600 pixels. 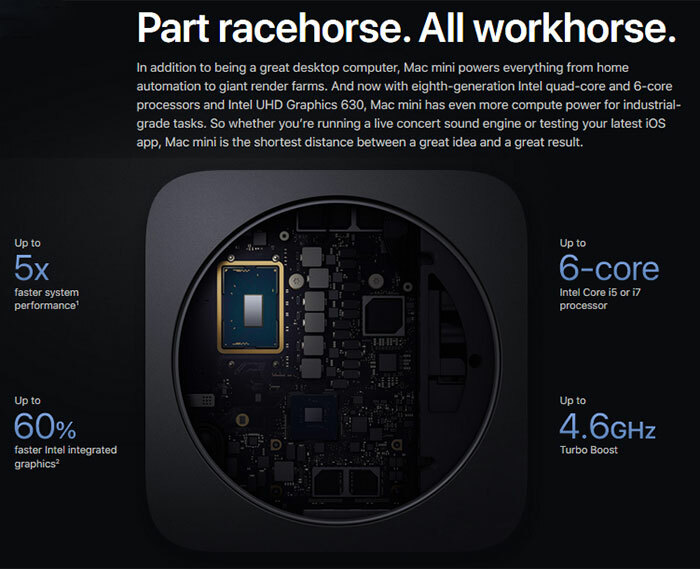 As with the Mac Mini, the new MacBook Air comes with an 8th gen Intel Core processor (just one choice here, a 1.6GHz dual-core mobile i5 which boosts up to 3.6GHz. Again the Apple T2 Security Chip makes an appearance to provide a "secure enclave," always-on Siri ready to respond, and on-the-fly data encryption - and again we have Touch ID integration. On the topic of key hardware components, the new MacBook Air comes with Intel UHD Graphics 617, 8GB onboard (upgradeable to 16GB) RAM, at least 128GB of PCIe storage (configurable to 1.5TB) . It can run on its 50.3Wh battery for up to 13 hours (iTunes film playback). 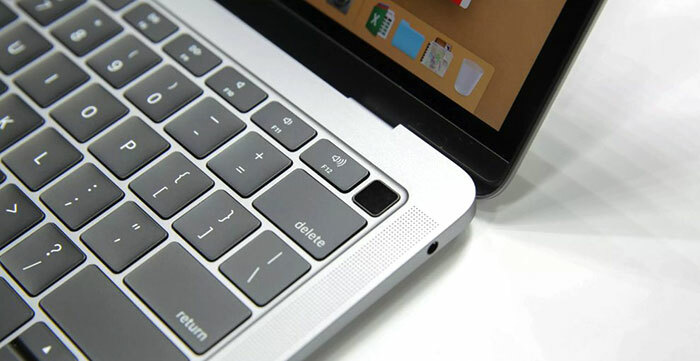 Other highlights of the new design are its latest generation backlit keyboard and the inclusion of the "industry's best trackpad," with pressure sensitivity and haptic feedback. Apple claims the new speakers are fuller and more immersive and capable of wide stereo reproduction. A 720p FaceTime HD camera and triple microphone setup flesh out the multimedia specs. Ports are limited to two Thunderbolt 3 (USB‑C) ports with support for charging, DisplayPort, Thunderbolt (up to 40Gbps), and USB‑C 3.1 Gen 2 (up to 10Gbps), and a single 3.5mm headphone jack. There is no (micro) SD card slot. Wirelessly you can communicate via 802.11ac Wi‑Fi or BT 4.2. The size and weight of this laptop is a key selling point and this latest model is 30.41 x 21.24 x 1.56cm, and weighs just 1.25kg. Apple says that it is 17 per cent smaller and a quarter pound lighter than the previous generation. 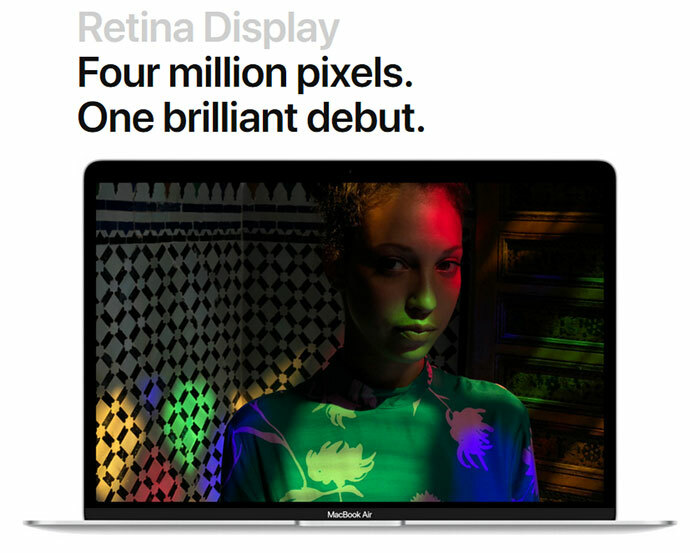 Lastly Apple wanted to highlight that this laptop is made from "a custom, Apple-designed aluminium alloy that enables the use of 100 percent recycled aluminium for the first time". This choice reduces the carbon footprint of the MacBook Air by 50 per cent. If you are interested in buying a new MacBook Air, they are priced from $1,199 / £1,199 and will ship from 6th November. Whichever new MacOS machine you buy it will come with the latest macOS Mojave pre-installed - with dark mode, Stacks desktop organisation feature, and familiar iOS apps available. its easy to be well over the grand mark with a few spec changes. Its a nice compact device but i just think how much PC one could get for the money. i just think how much PC one could get for the money. $799 = £799 in no ones conversion table. the Mini was a way to enter the Apple world, from £399, now they doubled it as a entry machine. even the MacBook Air is now over £1k. While I've never been a fan of apple pricing, especially of late, I think I can see what's going on at the moment. There have been plenty of rumours of Apple wanting to ditch intel cpu's etc in their laptop/desktops so they can use their own arm based designs, if you look at the pricing of their line up now, it's pushing you towards getting an iPad at the ‘consumer price range’ which uses their own cpu. Combine this with a push (likely at Apple's request, no matter what adobe say) for ‘professional’ grade hardware graphic software (a market which Apple is known for) and I'd say the ‘idea’ from Apple is to try and price people out of intel so they can do another change of processors in the ‘near’ future. As to the hardware releases, the air is seriously overpriced for what it is, the mac mini is overpriced for what it is and really needed a dedicated gpu (ie the intel/amd combo chip) rather than just using the intel one and the iPad Pro, all I could see during the presentation was basically ‘fluff’ because it's basically the same thing as last time with a cpu spec bump, a ‘marketing name’ display and a new case….it also only comes with 4GB of ram in most cases (6GB on 1TB version) which is anything but professional imo.